Super quick throttle response on mildly to highly tuned engines 150cc and up. 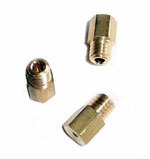 Perfect for use with Imola cylinder kits, or with TS1 kits when manifold #0172.H28 is also used. Carburetor alone.